This map features a so far unfinished boat stuck in the iron grips of long frozen ice in the arctic. Heavily based off of Franklins Lost Expedition and the novel "The Terror" by Dan Simmons. 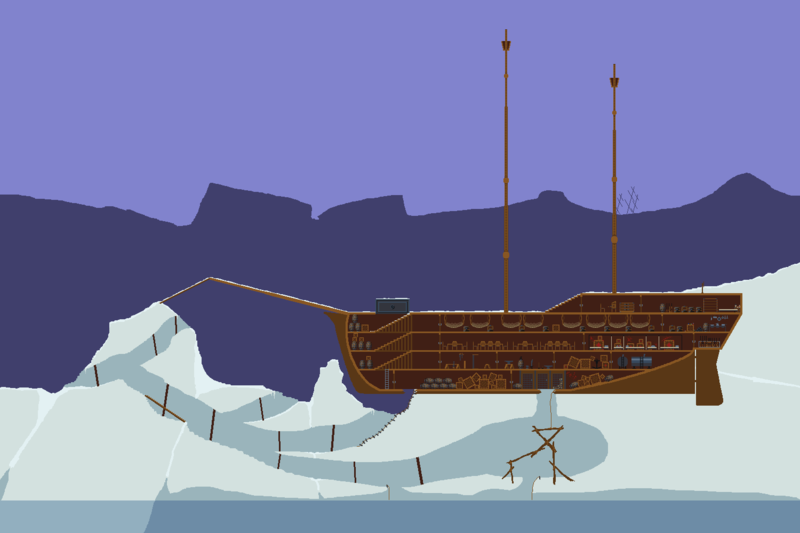 Wip: Finish boat (current one is a placeholder, a resize of an image on google), Fit ice around boat, finalize colors and layout, and generally refine the map. Patrick Voice: "THE HORROR, THE HORRORRRR!" Updated with a new ship and various other adjustments. I'd add some water under the ice, maybe the bottom of the boat could be a little broken, or maybe make a small dugout to the right, where there could be some skeletons of the crew or something. I dunno it looks nice but the railing on the ship is bugging me. Honestly I don't think there should be any railing on the bowsprit that looks kind of weird? I mean if anyone walked on it it would probably break anyway. Also the railing seems pretty high, I think compared to your guy it might not be easy to go over it but it'd be pretty easy to go under it. I mean the gaps are almost up to his neck? So maybe make the railing lower, thinner, and the supports closer together. I'm assuming you're planning to add other things as well? Three words, ''really pretty references''. I hate boats, they're all curvy in the wrong places. (11-01-2012 08:52 AM)Jafhar link Wrote: Three words, ''really pretty references''. I hate boats, they're all curvy in the wrong places. Not entirely sure what you mean by this but, I assume you mean to have references? I have plenty. I agree with lowering the railing. The ship though is still a large wip. That was just a general shape for the ship and i plan to sort of "carve out" the details from the larger shapes. That's cool then. Stupid boats. I got hopefully some better references for the boats now, the one that I had wasn't really what I was looking for. My design so far. I have mainly been working on the boat. Once I finish the boat i will update the landscape to look more like this rough sketch of what I hope it to look like. Do people think that the insides of the ship is too filled with junk that will make it unplayable? It's gonna be a bit time-consuming, but it's playable alright. Jesus christ that map got gorgeous. A little less cluttered would be good though. I think you are right jafhar, I might make it so the boxes and stuff arent at various angles. That should make it easier to edit. Still needs an officers quarters. Fill the ship with frozen corpses.